Oh Mya We Have Some Papaya!!! In our yard!! Today Tom came in and told me that we had fruit on the papaya tree in our yard. I didn’t even know we had a papaya tree :-) Anyway, I went out and got a picture of the young fruit and will write about it when we actually pick it and eat it. I thought it would be much longer before we could actually have fruit from our garden. We are planning to plan a coconut tree or two later this week – they are growing all over the land around us so we are just going to transplant a couple. 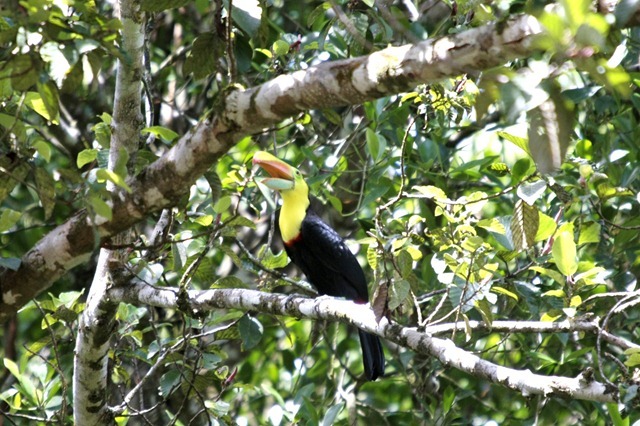 The toucan in the picture above was just hanging out in a tree right next to the house yesterday and Tom got a great shot of it. It is weird how sometimes they are just all over and other times they are no where to be found. Today I got my hair cut so I guess we really are settling in. Two days ago the vet and now a haircut. Feels just like home :-) The person who cut my hair is from Savanna, Georgia. She has been here ten years with her husband who is from Italy. They met when she was teaching at a university in Italy. He was working in African doing aid work at the time so they didn’t get to see each other much for two years. When he got back he asked her if she would move to Costa Rica and off they went. At the time she didn’t even know where it was. They have a six year old daughter and another due in November. He was trained as a veterinarian in Italy but here he is in construction – builds houses and buildings. She didn’t like it much the first couple of years but now she says she cannot imagine living anywhere else. That is the mantra that I keep hearing from most people who have been here for a while. Pura vida!!! !